Goalkeeper signed by Don Wilson from Ashton United making 5 Mossley appearances before returning Ashton United where he played in three different spells and also did the same with Hyde United. He later coached local youth football team Medlock Rangers. Full back signed by Howard Wilkinson from Retford Town in December 1976 making 10 Mossley appearances before moving to Kiveton Park FC. Later with Worksop Town, Corby Town and Grantham. Clifford Tarr joined Mossley as an amateur in 1922 making 5 appearances in the 1921-22 season but was understudy first to Ernie Moores and then Jackie Darley and he returned to play for Mossley West Lads, returning to Mossley to play in their newly formed reserve team in 1923. It wasn't until Darley's retirement that Tarr got an extended run in the team and he made 40 appearances in the 1926-27 season scoring 11 goals. A direct and tricky winger who's favourite trick was to knock the ball past his marker and run around the other side of him, he was selected that season to represent the Northern Counties against the Southern Counties at Dulwich scoring the only goal. He was then honoured to play for the Amateurs against the Professionals ( a regular fixture in those days) at Manchester City where he again excelled. He was a first team regular and oft goalscorer for the Lilywhites right up until the 1933-34 season when he retired from playing. He was selected to represent the Cheshire Leagueon several occasions, one such being against the Welsh National League at Caernarfon in 1929. Tarr was appointed Secretary and Player-Manager in April 1932, continuing playing until 1934 and then remaining as Secretary-Manager until 1937. A popular figure throughout his long association with Mossley AFC Clifford Tarr played a total of 275 games for Mossley scoring 47 goals. His son Dennis had a spell as a player at Mossley in the 1952-53 season and Clifford's brother Gilbert was Mossley Club President in the late 1960's and inaugurated the Club's Player of the Year award in 1971. Amateur half back signed from Mancunians FC making 16 and scoring 2 goals over the course of three seasons with Mossley in the early 1950's. He was the son of pre war Mossley manager Clifford Tarr. Born in Blyth on 11th May 1959. Jeffrey Tate began playing for Wallsend Boys Club where players such as Alan Shearer, Peter Beardsley and Steve Bruce began their illustrious careers. He played for England Schoolboys at under 18 level and was signed by Burnley where he went on to make 5 first team appearances scoring 1 goal. He was signed for Mossley by Bob Murphy whilst studyng at Manchester University after an injury plagued spell with Morecambe. Unfortunately injury curtialed his Mossley career and he made only 6 appearances scoring 3 goals. He did however play in Mossley's FA Cup tie at Huddersfield Town in December 1982. Former Hasilngden, Stockport County (34-0) and Rossendale United wing half who made 83 Mossley appearances scoring one goal over the course of three seasons in the early 1920's. Made 3 Mossley appearances and scored one goal in the 1921/22 season. Local centre forward who also played for Manchester City and Hurst and made 27 Mossley appearances scoring 13 goals over the course of two seasons in the early 1920's. Made a solitary Mossley appearance in the 1936/37 season after signing from Openshaw Clarence FC. Goalkeeper who made a solitary Mossley appearance in the 1947/48 season. Signed by Jason Beckford on one month loan from Barrow in January 2007 making 3 Mossley appearances. Later with Fleetwood Town, Kendal Town, Leek Town and Bamber Bridge. Centre half signed in the 1918/19 season from Withington FC and played 5 games in Mossley's one season in the Lancashire Combination Manchester Section and went on to make 37 appearances scoring one goal in the early Cheshire League seasons. Winger who made 43 Mossley appearances scoring 14 goals in the 1929/30 season after signing from Middlewich.Previously with Ripley Town and Nelson. Former Altrincham player signed from Hyde United who made 31 Mossley appearances in the 1963/64 season. Midfield player signed by Les Sutton from WInsford United in December 1991 making 11 Mossley appearances and scoring one goal before returning to Winsford February 1992. Later with Curzon Ashton, Flixton and Hyde United. Right sided midfielder signed by Dave Denby from Dukinfield Town in November 1993 making 17 Mossley appearances before he was released at the end of the 1993/94 season. Locally based goalkeeper signed from Mossley Amateurs FC making 4 Mossley appearances in the 2004/05 season deputising for Lee Bracey. Previously a junior with Oldham Athletic. Speedy wing back who previously played for Moss Side FC and Plymouth Argyle. Signed by Ally Pickering from Hyde United in January 2003 making 53 Mossley appearances and scoring 2 goals in three seasons with the club before returning to Hyde United in 2004. Spells with Atherton Collieries and Trafford followed before he re-signed for Mossley in September 2004 making a further 30 Mossley appearances and scoring 2 goals. Transferred to Woodley Sports in 2005 and was later with FC United of Manchester and New Mills. Michael Taylor is an uncompromising central midfielder or defender signed in the closed season of 2017 from Manchester league club Stockport Georgians FC where he was club captain. Nathan Taylor is a speedy forward who played for Rochdale as a junior before he was signed by Hamilton Academicals in 2006. He made his debut for Hamilton in January 2007 against Livingston in the Scottish Cup when still only 16 years old. Taylor then signed for Scottish Premier League club Gretna. Brief spells with Glasgow Celtic and then Rhyl followed before he signed for Clitheroe in 2009. He then joined FC Halifax Town ahead of the 2010/11 season. Taylor moved to Northwich Victoria in January 2011 and in February 2011 he moved clubs again this time joining Bradford Park Avenue before returning to Clitheroe at the beginning of the 2011/12 season and signed for Mossley in October 2011. Released in September 2012 and joined Salford City. Central defender Paul Taylor was signed by Benny Phillips from Manchester amateur side Connelly's late in the 1997-98 season after previously playing for Chorley, Frickley Athletic and Radcliffe Borough and became an instant hit with his controlled aggressive defending. Taylor made his Mossley debut against Kidsgrove Athletic on 1st April 1998 and the following season settled into the side partnering summer signing Ian Phillips. A season which saw Taylor win the first of his three Supporters Player of the Year awards as the team lost out on promotion to Workington in a hear-breaking final game of the season. When Ian Phillips’ career was tragically ended by injury in September 1999 Taylor found a new defensive partner in the classy Mark Paver as the by now team captain helped Mossley to a quarter final place in the FA Vase where the Lilywhites went out to eventual winners Deal Town. The 2000/01 season saw Taylor win his second Supporters Player of the Year award as he and Paver were again outstanding in the heart of the Mossley defence. The following season saw Benny Phillips depart as manager and Ally Pickering appointed in his place. Taylor kept his place whilst acquiring a new central defensive partner in the impressive shape of former Woodley Sports big man Mark Phillips. Taylor was voted Player of the Year for a third time. The 2002/03 season again saw Taylor skipper the siude as they again reached the quarter finals of the FA Vase, again losing to eventual winners in AFC Sudbury. 2003 also saw Taylor pick up silverware as he captained the team to a 2-1 Worthington NWCL Final victory over Clitheroe at Bury FC’s Gigg Lane. 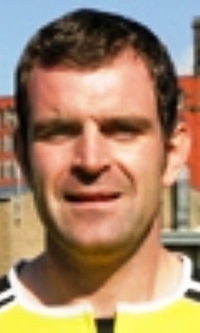 The 2003/04 season saw Jason Beckford replace Pickering as manager, but the now long serving Taylor still retained his place in the team as the side earned promotion to the UniBond NPL despite losing the title to Clitheroe due to an administrative error. Having reached his mid 30’s Taylor made just 13 appearances in the UniBond League having lost his place to the emerging Danny Meadowcroft before departing for Woodley Sports in October 2004. He had later spells with Oldham Town and Ramsbottom United before playing the last games of his career whilst serving as assistant manager at Prestwich Heys. Former Stalybridge Celtic and Hyde United player who made 13 Mossley appearances in the immediate pre WWII season of 1939/40. Inside forward who made 2 Mossley appearances in the first post WWII season of 1945/46. Also played for Audenshaw FC, Hyde United, Stalybridge Celtic and Hurst. Inside forward who scored 13 goals in 39 Mossley appearances in two seasons in the early 1920's. Signed from Woodley Sports on trial scoring in his only Mossley appearance in a Lancs Floodlit League game in April 1987. Steven Jeffrey Taylor served his football apprenticeship with Bolton Wanderers where he signed professional in October 1973. A prolific goalscorer he netted 16 goals in 40 appearances before a £38,000 transfer to Oldham Athletic in October 1977. He scored 25 goals in 47 games for Oldham and was transferred to Luton Town for £75,000 in January 1979. An unsuccessful spell at Luton saw him sold on again for the same fee to Mansfield Town where he fared little better before £35,000 brought him back to Lancashire and Burnley where he scored 37 goals in 86 games. Then followed spells with Wigan Athletic (30 games 7 goals), Stockport County (26-8), Rochdale (84-42), Preston (5-2), Burnley again (45-6) and Rochdale again 17-4) playing the final League game of his career in March 1989. He spent a lengthy time out of football before being a surprise appointment as Mossley manager in August 1993. He was soon found to be out of his depth and his lack of managerial experience became quickly evident and after only one win in 13 games, which included a couple of heavy defeats, Taylor left 'by mutual agreement'. Taylor made just 4 appearances for Mossley scoring 1 goal. Full back who was signed from Winsford United making 72 Mossley appearances and scoring 2 goals over the course of the first three seasons following WWII before returning to Winsford United. Amateur half back signed from Failsworth FC making 14 appearances and scoring one goal in two seasons in the mid 1920's. Left winger who made 3 Mossley appearances in the early 1930's after signing from Sandbach Ramblers. Winger who made 61 Mossley appearances scoring 14 goals in two seasons with the club in the late 1950's before he was transferred to Witton Albion for £100 fee in the closed season of 1960. Amateur winger signed from Kilngreen FC who made 12 appearances and scored 2 goals in the 1936/37 season before transferring to Wigan Athletic. Full back who made a solitary Mossley appearance in the 1923/24 season after signing from Oldham based amateur team Shawside FC. Born in Huddersfield on 13th February 1968. Andrew John "Andy" Thackeray began his playing career in the Manchester City’s youth team that won the FA Youth Cup in 1986, but he moved on to Huddersfield Town without appearing for City's first team. He played only twice for Huddersfield, then spent a season with Newport County (then still a Football League club), before going on to make more than 150 league appearances for each of his next two employers, Wrexham and Rochdale. Famously he played in his usual right full back position for Wrexham when Mickey Thomas’ “wonder goal” knocked competition favourites Arsenal out of the FA Cup in 1992. In the 1997/98 season he helped Halifax Town to promotion from the Conference and played one more season in the Football League. Thackeray then returned to the Conference, spending four seasons with Nuneaton Borough. In 2003 he joined Ashton United, where he scored 5 goals from 91 games in all competitions, and for a time acted as assistant manager. His final club before retirement was Mossley, where he scored 4 goals from 74 games, and won the Supporters Player of the Year award in helping the Lilywhites to the Northern Premier League Division One title in the 2005–06 season. Thackeray later worked as a chiropodist in the Huddersfield area. Born on 17th September 1994. Christian is an agile young goalkeeper signed in the closed season of 2013 from Hyde FC on dual registration. Previously with youth teamer with Fleetwood Town having previously been at Burnley as a junior. He re-signed for Hyde FC in August 2014. He later played for Liversedge FC. Half back who made a solitary Mossley appearance in the 1929/30 season. Versatile former Winsford United player signed by Benny Phillips from Droylsden in September 1999 making 68 appearances and scoring 12 goals for Mossley broken by a brief spell with Droylsden in 2001. Later joined Flixton as assistant manager. Experienced former Maine Road, Radcliffe Borough and Stalybridge Celtic centre half signed by Kevan Keelan from Horwich RMI in August 1995 making 48 appearances and scoring 2 goals before being released to join Prestwich Heys. He won representative honours for the British Fire Brigade team. Born on 12th August 1992. Michael Thomas graduated through Macclesfield Town's Academy to make his first team debut on 29th September 2009 for Macclesfield Town in their 1–1 away draw with Burton Albion in League Two. In October 2010 he joined Mossley on loan making 28 appearances and scoring 2 goals playing in central defence and occasionally in a defensive midfield role. Upon returning to Macclesfield he joined Leek Town on the eve of the 2011/12 season. He was recalled to Macclesfield's first team in the 2011/12 season and made 10 appearances before the season's close. In May 2012 following Macclesfield's relegation to the Conference, Thomas was released at the expiry of his contract. He joined Colwyn Bay in the summer of 2012, he moved back to Leek Town in October 2012. He then joined Northwich Victoria in 2013 before re-signing for Mossley in September 2015 having more recently been playing for Linotype Cheadle Heath Nomads in the Cheshire League. Departed to work in the Netherlands in April 2016. Had a later spell with Winsford United in the 2017/18 season. Made a solitary Mossley appearance in the 1948/49 season. Signed by Jason Beckford in August 2005 after impressing in pre season following his release by Bury at the end of 2004/05 season. He appeared in a variety of defensive and midfield positions for Mossley in their title winning 2005/06 campaign. He won the Mossleyweb Player of the Year in 2006/07. He returned to Mossley in October 2007 after a brief spell out of the game and made a total of 99 Mossley appearances scoring one goal. Later with Oldham Town and Bacup Borough. Central midfield player signed by Kevan Keelan from Ashton United making a solitary Mossley apppearance in the 1996/97 season before transferring to Caernarfon Town in an exchange deal that brought Mark Murray to Mossley. He was re-signed from Caernarfon Town by Benny Phillips in 1997 and made a further 42 appearances scoring 4 goals before being released to join Wilmslow Albion where his father was club chairman. Signed from Northern Nomads scoring in his solitary Mossley appearance in the 1937/38 season. Signed from Manchester United on loan making 2 Mossley appearances in the 1936/37 season. Born on 17th October 1931. Full back who previously played for Bolton Wanderers as a junior and made 32 Mossley appearances in the 1955/56 season. Later emigrated to Canada and became a highly successful businessman. Winger signed from Styal on trial making a solitary appearance as a substitute in the 2000/01 season. Signed from Rawmarsh FC scoring in his only Mossley appearance in the 1935/36 season before transferring to Droylsden. Highly rated centre forward and prolific goal scorer signed from Stalybridge Celtic in August 1948. He scored 54 goals in 78 Mossley appearances finishing as Mossley's leading scorer in the 1948/49 and 1949/50 seasons. Born on .5th March 1916. Died 1994. Richard 'Dicky' Threlfall was signed by Sam Cowan from Manchester City in August 1937 making 112 appearances and scoring 2 goals in three seasons with Mossley . He was transferred to Bolton Wanderers in 1940 and played in Bolton's 1944 War time Cup Final win before re-signing for Mossley in August 1946 making a further 48 Mossley appearances and scoring 4 goals before being transferred to Halifax Town (30-0) for a £250 fee in October 1947. He later played for Wellington Town and Altrincham. Full back who made a solitary Mossley appearance in the first Chesire League season of 1919/20. Inside forward or left winger signed from Accrington Stanley who made 41 Mossley appearances and scored 10 goals in two seasons with the club in the early 1950's. Later with Ashton United and Altrincham. Former Ashton United winger who made 22 Mossley appearances scoring 2 goals under Don Wilson in the mid 1960's. Later played for Glossop and Curzon Ashton. Born on 11th October 1992. Matthew Tierney is a no-nonsense defensive midfielder who can also play in central defence signed in December 2013. He started out as a youth team player for FC United of Manchester, working his way through to the first team before joining Radcliffe Borough. He had a second spell with FC United and was then with Salford City and more recently Stockport Sports. He was released in January 2014. Goalkeeper signed by Don Wilson from Stalybridge Celtic who made 5 Mossley appearances in the 1965/66 season deputising for Don Booth. Terence William 'Tommy' Tighe was a former Dunfirmline Athletic, Accrington Stanley (117-20), Crewe Alexandra (86-5) and Southport (36-3) wing half who began his career as an inside forward and moved back to wing-half during his successful spell with Accrington Stanley. His career began with Newton Grange Star and he graduated to play for Hibernian between 1953/4. He spent 1956-57 with Dunfermline and joined Accrington, then members of the 3rd Division North in June 1957. After leaving Accrington he joined Crewe Alexandra in December 1960 (5 goals in 86 League games) and moved to Southport in August 1963 (3 goals in 36 League games). He spent 1964/5 with Runcorn. He made 3 Mossley appearances in the 1966/67 season before finishing his career at Great Harwood. Born in Lurgan, Northern Ireland on 13th January 1930. Died on 11th August 2008. Peter Tilley began his career with Newton Heath Loco FC before signing for Mossley under Jack Boothway in the 1951/52 season scoring 14 goals in 21 appearances before he was transferred to Witton Albion for £420 fee. He later played for Arsenal (1-0) and Bury (86-12). Tilley briefly re-signed for Mossley from Halifax Town (184-17) making 3 further appearances in the 1963/64 season before transferring to Ashton United. Signed by Bob Murphy from Curzon Ashton in August 1982 making 12 Mossley appearances before transferring to Glossop in January 1983. He was the son of former Mossley player Peter Tilley (snr). Ashley Timms began his career with Atherton LR before being snapped up by Manchester City. He was initially released in 2003 and had brief spells on trial with Bolton Wanderers and Oldham Athletic before City re-signed him after a short time with Altrincham where he played both in the first team and their FA Youth Cup team. Signed for Mossley from Leigh RMI but made just 2 appearances in the 2004/05 season both against Bridlington Town in the FA Trophy replacing the injured Lee Bracey. He later played for Runcorn, Accrington Stanley, Barrow, Stalybridge Celtic, Tamworth, Cambridge City, Wakefield, Ilkeston FC, Worksop Town, Hemel Hempstead, Hinckley United, Boston United, Maidenhead United, Chelmsford City, Ilkeston, Worksop Town, Kings Lynn Town and Stamford. Born in Flettwood 1st january 1951. Alan Tinsley was a skilful playmaking midfielder. He played for Preston North End (9-1), where left to join Bury (94-15) in August 1970. On leaving Bury in 1975, he joined Mossley making 79 appearances and scoring 7 goals in two seasons with the Lilywhites. He later played for Fleetwood Town before joining Blackpool Wren Rovers. Tinsley left Rovers to rejoin Mossley in October 1980, remaining with them until the end of the season making 15 further appearances. With Mossley he missed their FA Cup shock win at home to Football League side Crewe Alexandra, but did play in the second round tie which Mossley lost 3-1 at home to Mansfield Town. After leaving Mossley he re-signed for Fleetwood Town. He later became manager of Fleetwood Town and in 1994 became manager of Lancaster City. He resigned in November 1996 but had a second spell in charge of Lancaster from 1998 to March 1999. Experienced midfielder signed from Skelmersdale United making 31 appearances and scoring 3 goals. Previously with Leeds United, Macclesfield Town, Altrincham, Leek Town, Hyde United and Kidsgrove Athletic. Later with Flixton, Salford City and Prescot Cables. Made a solitary brief appearance on trial from Yorkshire amateur team Heywood Irish Centre FC after impressing in a friendly against Mossley. Born in Hartlepool on 7th March 1972. Experienced former Football League wing back signed by Jason Beckford in August 2003 making 6 Mossley appearances. Previously with Stockport County (301-4), Southampton (11-0), Bradford City (19-0) and Rochdale (54-3). He was transferred from Stockport to Southampton for an £850,000 fee and from Stockport to Bradford City for £250,000. Transferred to Stalybridge Celtic but retired from playing soon after. Born in Walsall on 25th October 1973. Former Walsall (13-2), Oldham Athletic (3-0), Bradford City (76-17), York City (90-19), and Southend United (41-11) centre forward who's brief spell was hampered by injury limiting him to just one appearance. Later with Kettering Town, Halifax Town and then Hyde United where he became player-manager. Joined Altrincham as assistant manager in June 2011. Born in Blackburn on 4th June 1924. Robert 'Bob' Tomlinson signed for Mossley in 1948 from Accrington Stanley (48-0) . Previously with Blackburn Rovers (25-0). Transferred to Halifax Town (9-0) and was later with Ashton United and Altrincham. He made 154 appearances for Mossley at right back over three seasons. Made 2 Mossley appearances in the 1952/53 season. Versatile defender or midfield player signed by Bryan Griffiths from Burscough in September 1989 making 16 Mossley appearances and scoring 2 goals. Followed Griffiths to Morecambe in December 1989 and later played for Accrington Stanley. Liam Tongue is a talented teenage midfielder snapped up in March 2016 from North West Counties Leaguers Cheadle Town having begun his playing days with Manchester League club Stockport Georgians. Later played for Marine and Stalybridge Celtic. Born in Oldham in 1917 Died: unknown. Winger William Charles Tooley began his playing career with Royton Amateurs before joining New Mills. Signed for Mossley by Jim Scullion in August 1936 making 26 appearances scoring 5 goals in the 1936/37 season. Went on trial with Manchester United before signing for Hurst in 1938. Made 2 Mossley appearance in the inaugural Cheshire League season of 1919/20. Born in Dewsbury on 7th September 1976. Prolific striker Danny Toronczak was signed in November 2007 from Belper Town. He signed for Belper in the close season from Ossett Albion and was their leading scorer with 9 goals from 19 appearances at the time. Previously, he had six seasons at Ossett Albion, having originally signed for the West Yorkshire club in August 2001. He was a prolific goal scorer, who notched 143 goals in just 235 games for Albion during his spell at Dimple Wells. He missed much of the 2005/06 season through injury but recovered well to find the net 29 times in the 2006/07 season. Transferred to Clitheroe early in 2008. Later with Salford City and New Mills. Returned to Mossley for a second spell in March 2009. Later with Silsden and Clitheroe. Born in Northampton on 17th March 1905. Died on 19th October 1987. Ernest Toseland began his career as a footballer playing for Higham Ferrers Town and then Northampton Town and Queens Park Rangers. In 1928 he turned professional by signing for Manchester City who were then in the First Division. He was part of the City team until 1938 and appeared 368 times, scoring 61 goals in the process. Toseland joined a strong forward line at City which included England internationals such as outside left Eric Brook, inside forward Tommy Johnson and centre forward Fred Tilson. The City team also included the England international centre half and later Mossley manager Sam Cowan and Scotland captain Jimmy McMullan. Toseland's first goal for City was scored in a 3–0 victory over Aston Villa in the 1928–29 season. That season City finished eighth and Tommy Johnson scored a club record of 38 league goals. In the 1929–30 season Manchester City finished third in the first division, three points behind runners up Derby County. Toseland scored three goals in the FA Cup that season but Manchester City were knocked out by Hull City in the 5th round. In the 1930–31 season, City finished eighth in the league and Toseland scored ten league goals for the club. Eric Brook was the teams leading goalscorer that season with 16 goals. In the 1931–32 season the City team, which now included the Scottish centre forward Alec Herd, managed to reach the semi final of the FA Cup but were defeated by Arsenal by 1–0 with a goal from England international Cliff Bastin. In the following season, Toseland helped City reach the final. In the 1933 FA Cup Final he was part of the Manchester City team that was defeated three goals to nil by Everton who were captained by England international Dixie Dean. The Everton team also included former City player Tommy Johnson. In the 1934 FA Cup Final Toseland was part of the City team which beat Portsmouth 2–1. Toseland had scored once in a 6–1 demolition of Aston Villa in the semi final of that years competition. The other goals were scored by Alec Herd and Fred Tilson (who scored four). In the 1934–35 season Toseland scored five goals and City finished fourth in the league, ten points behind champions Arsenal. One of Toseland's five goals that season came in a memorable 5–0 victory against Wolverhampton Wanderers on the final day of the season. The team went on an unbeaten run after Christmas, winning 14 times and drawing 6 games. The championship was won at Maine Road with a 4–1 victory over Sheffield Wednesday. In the 1937–38 football season Toseland was part of the City team that were relegated from the first division despite scoring more goals than any other team. In 1938 he transferred to Sheffield Wednesday but only played fifteen times for his new team before the outbreak of WWII. Following the war Toseland signed for Mossley at the age of 41 and scored 12 goals in 49 appearances for the Lilywhites in the 1946-47 season before hanging up his boots for good. Born on 20th October 1991. Young striker signed in September 2010 upon his realease by Bury. Previously a junior with Bolton Wanderers. Played regularly for the Mossley reserve team in 2010/11 and into 2011/12 while also playing for Prestwich Heys. Former Rochdale (32-0) full back signed by Bob Murphy from Manley (Australia) making 10 appearances in the 1983/84 season. Full back who made a solitary Mossley appearance in the 1929/30 season. Born in Abbruzzo, Italy on 27th October 1994. Christian Travaglini is a young Italian born striker signed in August 2014 from Hyde FC. He was previously with Italian clubs Lazio, Cesena and Guillanova Calcio and represented Canada at under 20 level. Wing half who made 2 Mossley appearances in the 1947/48 season. Born on 18th December 1977. Robert Trees began his career as a youth player with his hometown club Manchester United. After a loan spell at Stalybridge Celtic, he moved to Bristol Rovers in 1998, where he scored one goal in 46 league appearances. Trees also had loan spells at Altrincham for a couple of months in 1999, and at Leigh RMI. Leigh signed him on a permanent basis in February 2001, but he soon moved on to Droylsden in August of the same year. He was signed for Mossley by Ally Pickering from Droylsden in August 2002 making 37 Mossley appearances in the 2002/03 season. He then joined Hyde United in the summer of 2003, but his spell there was short-lived and he moved to Abbey Hey that December. After 18 months with Abbey Hey, Trees joined the newly formed FC United of Manchester in July 2005 and was part of the club's initial 20-man squad for their 2005–06 pre-season. However, he never played in a senior game for them. Former Northwich Victoria full back signed from Hyde United making 7 Mossley appearances in the 1960/61 season. He later played for South Coast United in Sydney, Australia. Made 4 Mossley appearances in the first post WWII season of 1945/46. Wing half signed by Don Wilson from Hyde United making 8 Mossley appearances and scoring one goal in the 1965/66 season. Centre forward signed from Crewe Alexandra (8-1) who scored 4 goals in 7 Mossley appearances in the 1931/32 season. Born in Leeds on 21st February 1983. Goalkeeper signed by Jason Beckford from Bradford Park Avenue in May 2006 after previously serving Wakefield Emley. Formerly with Ashton United but signed for the Yorkshire club in March 2005. He began his playing career with Southampton and was also on the books of Huddersfield Town. Jack Tuohy is a talented attacking midfield player snapped up from Chadderton in the closed season of 2017. He was previously a full professional with Oldham Athletic where he made 2 first team appearances. Departed to Gainsborough Trinity at the end of the 2017/18 season before joining Glossop North End soon after. Diminutive locally based striker who was signed from Stalybridge Celtic in November 2006 by Jason Beckford. Nick-named 'Turbo' he began his career with York City and then played for Scarborough, an initial spell with Stalybridge followed and then a time at Harrogate Town before returning to Stalybridge. He made 26 appearances for Mossley under jason beckford scoring 5 goals in the 2006/07 season. Made 2 Mossley appearances in the 1949/50 season. Wing half who made 15 Mossley appearances scoring 2 goals in the 1934/35 season after signing from Yorkshire League team Rawmarsh FC. Half back signed from Halifax Town (7-0) who made 20 Mossley appearances scoring one goal in the 1947/48 season. Winger signed from Glossop on trial making 2 Mossley appearances in the Lancs Floodlit League in the 1986/87 season. Former Darlington, Huddersfield Town (364-0) and Fulham (68-0) goalkeeper signed who made 4 appearancces for Mossley in the war-time season of 1939/40.. He played for Felling Colliery and Gateshead High Fell, before moving to Huddersfield in 1926 for whom he appearaed in the 1930 FA Cup final when Huddersfield lost 2-1 to Arsenal at Wembley Stadium. He also twice represented England against France & Belgium in 1931. Played for Hurst following WWII. Hard tackling left back signed by Don Wilson from Altrincham in February 1970 and went on to make 174 Mossley appearances scoring 7 goals. Followed manager Don Wilson to Radcliffe Borough in May 1973. Later played for Hyde United and eventually became Commercial Manager at Manchester City. Big centre forward signed in March 1996 from Ashton United making 7 Mossley appearances and scoring one goal before transferring to Witton Albion. He re-signed for Mossley via Trafford and Maine Road in the 2001/02 season making a further 23 appearances and scoring 8 goals. Full back signed from Huddersfield Town who made 10 Mossley appearances in the 1923/24 season. James Tyrell-Nestor was signed in July 2006 after impressing in Mossley's pre season buiild up. His previous club was Wakefield-Emley but he first came to prominence scoring goals for Ossett Town. A Talented striker or midfielder who signed for Eastwood Town in May 2004 but then switched to Ossett Town four months later. Started out on the books at Halifax Town and also had spells with Farsley Celtic and Eccleshill United before earning rave reviews with his performances for Liversedge in the Northern Counties East League. Released to join Farsley Celtic after just 4 substitute appearances for Mossley. Later with Guiseley and Harrogate Railway Athletic. Born in Manchester on 25th February 1931. Arthur Spencer Tyrer was a highly rated wing half signed from Manchester City. He was transferred to Leeds United (39-4) in September 1950 for a then Mossley record £2,000 fee. Tyrer later played for Shrewsbury Town (24-3), Aldershot (235-9) and Peterborough United. He played in the same Leeds United team as the legendary Welsh International John Charles. Goalkeeper who made 3 Mossley appearances in the 1949/50 season. Brother of then Mossley team-mate Arthur Tyrer.